A woman was left disabled after following a "detox" diet which involved drinking large quantities of water. Although doctors stress the need to avoid dehydration by drinking enough fluids, drinking more than enough is a different matter. The human body may be mostly water, but you can have too much of a good thing. 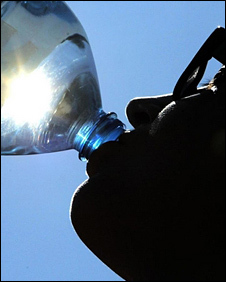 In the most serious cases, "water intoxication" can kill, and there is, say experts, scant evidence that drinking even slightly more water than usual can improve your health. The current popularity of detox diets which recommend drinking many litres of water a day, and drinking even when not thirsty, could cause problems if taken to extremes, they say. The claim is that drinking more than usual can do everything from improving your skin tone to "flushing out" toxins from your body. However, the amount of water actually needed in a day varies from person to person, and depends on other factors such as climate, and exercise, says the British Dietetic Association. Ursula Arens, a dietician, said that there was a difference between normal consumption of one or two litres a day, not just in the form of water, but also from coffee, tea, and juice, and constant, ritualistic consumption of water throughout the day. "You shouldn't be drinking massively over and above what you feel with comfortable with, when you're not thirsty, in a mechanical way." She said that the evidence supporting the whole "hydration industry" was flawed. "If you're a top sportsman, earning £10,000 for a single game, I can understand the need to focus intensely on your hydration, but not if you're someone just doing a couple of lengths at the swimming pool. "It's just a great marketing opportunity, nothing more." She said that the science of detoxing was unsupported by evidence, partly because its precise effects on the body had never been defined. She added: "The body already has perfectly good ways of getting rid of toxins - mainly in the liver, and it's hard to see how consuming more water would affect these." Others are more scathing about the fashion for both detoxing and taking frequent sips from an ever-present bottle of mineral water. Kidney specialist Professor Graham MacGregor said there was no evidence that either had any benefit. He described how too much water could "overwhelm" the body's natural mechanisms for keeping levels in balance. "The body already has a brilliant system for doing this, but if water levels in the blood rise too high, it just can't cope." If vast quantities of water are taken, salt in the blood gets too dilute, he explained. When the salt solution in the blood is weaker than the solution in the cells and organs it supplies, water passes into those cells and organs. In extreme cases, this causes organs such as the brain to swell up, and can stop it working properly, putting the drinker in serious danger. Professor MacGregor said: "This isn't just a problem with water - we used to see patients who had been diagnosed with 'water intoxication' after drinking 20 pints of beer." "In normal circumstances, then people should drink when their body tells them to - when they get thirsty. "Anything else is completely unnecessary, and will just leave you standing in the queue for the toilet. "Detox diets are a complete con in that respect."